Check out the new Seagrass Viewer for Bays! 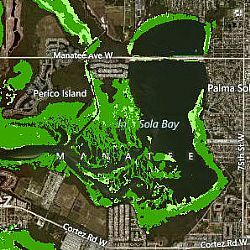 Seagrass coverage varies over time, with water quality, shoreline changes, weather, marine traffic, and other factors. You can observe these changes with the new interactive seagrass viewer, now available on the habitats/ecology pages for all coastal bays. It maps collected seagrass coverage data in two-year increments, characterizing it as either "continuous" or "patchy." An accompanying graph gives the total coverage for each year surveyed, with data provided by the Southwest Florida Water Management District.